As a vacation property owner, you want your message to stand out from the clutter of voices online, as well as to create an oasis that will bring people back to you repeatedly. Not sure where to start? Here are some helpful tips for creating enticing images for your listings, and for creating a welcoming environment that will keep vacationers coming back to you every year! 1. Less is more. A vacation home needs to be a space that a family or couple can customize for themselves in a short amount of time. Anything that personally applies to you, such as personal photos, correspondence, or extra knick-knacks, will only get in the way of a vacationer's experience. 2. Give your space some personality! While you want to clear out personal clutter, you do want to keep decorative touches that maintain a theme throughout your space. For seaside properties, for example, a nautical theme is popular because it accentuates the location that is so desperately sought after by vacationers. Be sure to keep decor light and neutral so as to avoid making it feel dark and somber. For pops of color and contrast, consider accent pieces like pillows or light fixtures in strong colors. 3. Lighting, lighting, lighting. Nobody wants to walk into a vacation home and feel like they've walked into a cave. Accent lights throughout create a sense of warmth and brightness, and are welcoming to guests. Be sure to have lights directed towards corners or any unique architectural features. 4. Show off the best assets. Decorate around the property's best features. Does your property have spectacular views? Make sure all windows and glass doors are clean and well-functioning! Is the kitchen stocked with appliances? Include accessories in the kitchen to encourage cooking family meals. 5. Put yourself in their shoes. When planning out finishing touches for your guests, walk through what a typical day for them might be like. This will also help when filling in details of your listing, as well as when you guide the photographer as to what photos are needed to properly show off all the wonderful amenities. 6. Have fun with it! Don't forget kids and pets. Vacations often involve kids, and lots of families these days enjoy bringing their pet along for a trip. Consider toys and accessories for children or pets! Extra accessories like baby wipes, a rubber ducky for the tub, or a doggy treat can all make a big impact and help to bring those guests straight back to you next year. 7. Invest in photos. Be sure to have an experienced professional do photos for your listing. Listing photos are what grab the attention of potential renters, so be sure to use the slots in your listing wisely! These images will be used repeatedly to book your property, investing a bit of your budget in quality photos will pay for itself almost immediately. Do you want photos that present your home in the best way, but are not ready to hire a professional photographer? Get your FREE e-book that will give you 5 tips to step up the quality of your interior architectural photos TODAY. Click here. As a San Diego based architectural photography business, serving both local and international clientele, founder and lead photographer Natalia Robert brings her background as an architectural designer forward to produce luxurious images that create a sense of warmth and culture. Natalia has lived and worked in three continents and her work can be seen in venues such as AirBnB, San Diego Home/Garden Lifestyle, TEDxSanDiego events, countless small business websites and family home walls. Today, her furry co-pilot, Daisy, inspires a daily sense of wanderlust while serving as a reminder of how valuable it is to maintain a sense of HOME. On the heels of Halloween, November 1 and 2, Mexico celebrates the Day of the Dead (Dia de los Muertos), a tradition that originated with the indigenous people in Pre-Colombian times and later adapted to the Christian All Saint’s Day. The frivolity of Halloween is still there but with the added dimension of reverence for the dead. On Dia de los Muertos, the return of their spirits is welcomed. 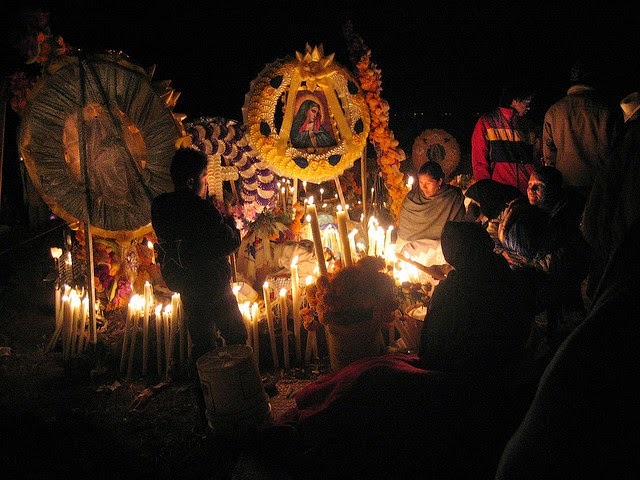 It is believed that a veil between the worlds of the living and the dead is the thinnest on Muerto nights. Death as something spooky or an event to be feared is mocked with decorations depicting playful skeletons in all walks of life (er, former life that is) -- young and old, cowboys and office clerks, mothers and babies, dancers and musicians, you name it. Skull themes are everywhere. Even skull shaped candy for the kids. 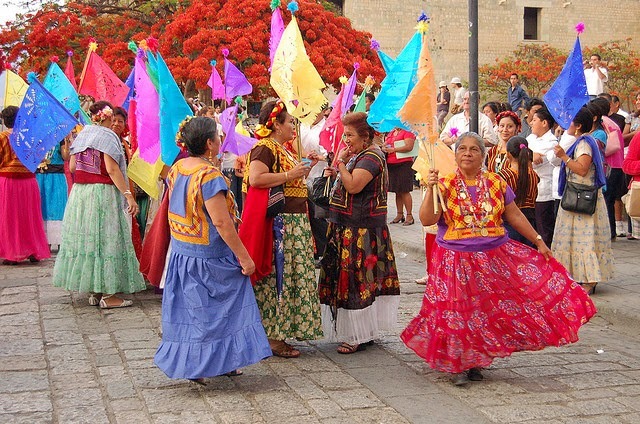 The festivities include colorful street parades with brass bands, mariachis and fireworks. Some towns stage comparsas, theatrical performances representing the return of the dead. The whole thing is a party to die for. While there is a lot going on during Muertos, the main stage is the local cemetery. Families erect elaborate memorial altars at the graves of their dearly departed, filling it with flowers, candles, decorations, and the deceased’s favorite food and drink. They cheerfully gather at the altars with candlelight vigils, mariachi music, shared bottles of tequila and picnics on the cemetery grounds. 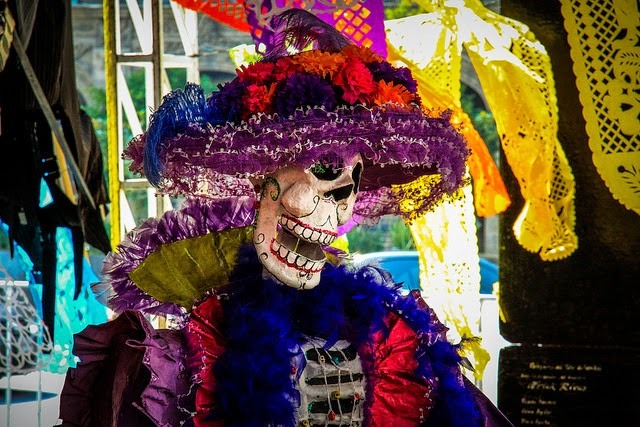 Halloween and Dia de los Muertos are ideal times to visit Mexico. It is off season. Tourist traffic is down, the weather is mild, and you will be catching Mexico’s biggest fiesta of the year. It is also a great time to consider visiting inland cities. Non-coastal Mexico will amaze you. 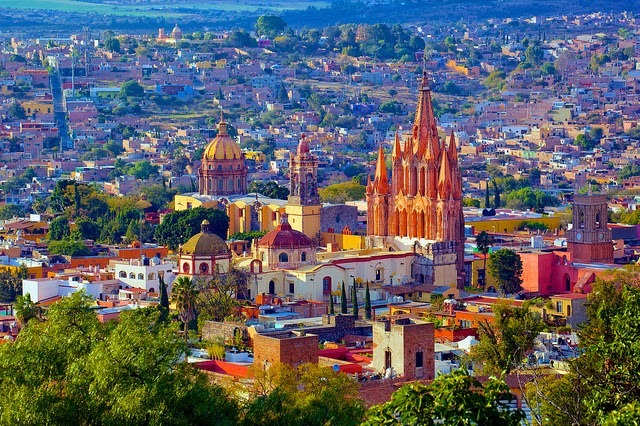 The International Vacation Home Exchange offers properties in two inland locations – the beautiful colonial cities of San Miguel de Allende in east/central Mexico and Oaxaca in southern Mexico. Oaxaca offers a treasure of historic colonial-era buildings and monuments, as well as native Zapotec and Mixtec cultures and archeological sites. A city of some 270,000, Oaxaca is filled with fantastic museums, colorful handicrafts, beautiful baroque churches, inexpensive markets and elegant five-star restaurants. 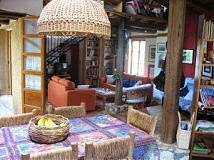 Your home in Oaxaca is a charming country house in a quiet wooded setting, yet it is only 15 minutes from the city’s main plaza. It has three bedrooms that can comfortably sleep five, a big kitchen, spacious living room, plus two terraces and a large garden. established by foreign artists -- Instituto Allende and the Escuela de Bellas Artes. Artists and writers from Mexico and the world, as well as tourists and retirees, are still drawn to the city. There are some 140,000 residents in the metro area. The actual town of San Miguel counts about 80,000. Of these, 10-15 % is ex-pat retirees, mostly from the United States. This lovely hideaway is located just a few short blocks from the central plaza, "the Jardin," and within walking minutes from the Warren Hardy Language School, the San Juan de Dios Public Market, the Belles Artes, Angela Peralta Theater, the Instituto and Parke Juarez. This four-bedroom, four-bath home is open and airy with unobstructed views of the city, a lake and the Sierra Madre Mountains. Each room has its own carved cantera fireplace and a full bath. A fully-equipped kitchen and spacious living room are on the first level, as well as an outdoor sala and barbeque grill. The master bedroom and bath and a second bedroom with a trundle bed are on this level. On the second level, you can walk out from either of two large bedrooms onto a terrace where you will find a secret garden and a stairway leading to the third level. There is a relaxing sitting area and a thriving herb garden on the third-level terrace. A housekeeper is available three times a week or more if desired. A cook can also be arranged and payment made directly to him. A 2007 car is also available for your use with no extra credits required. 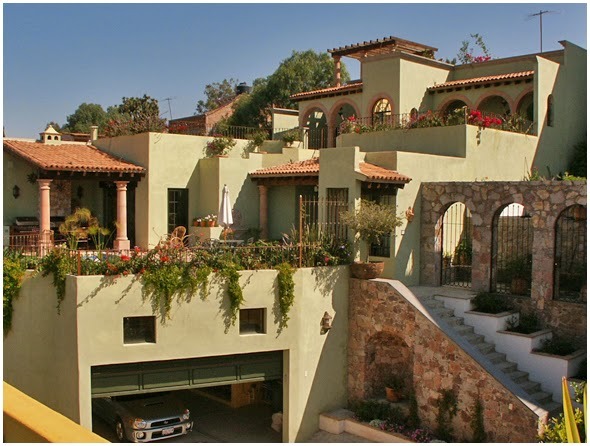 Click the property #’s above to find out more about these casa exchanges in Mexico. 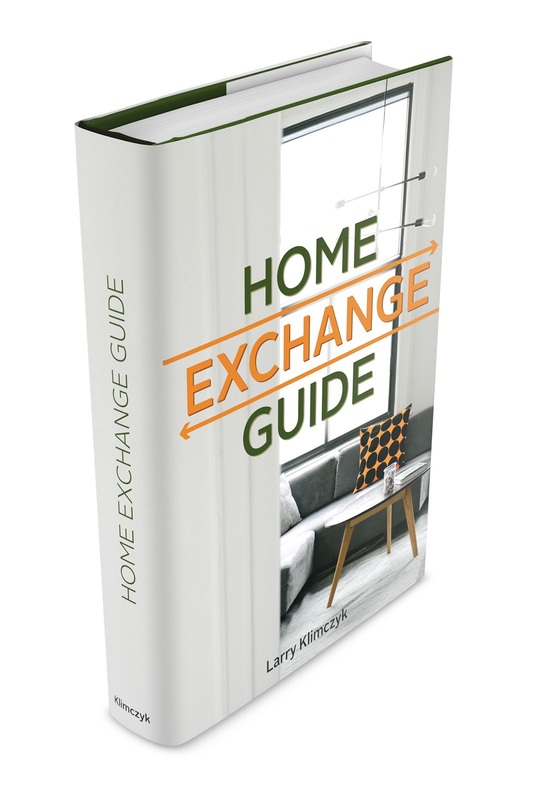 To find out more about the International Vacation Home Exchange that brings these, and hundred of other properties around the world, to you, visit www.ivhe.com. The Gold Coast of Queensland is Camelot by the sea, attracting millions of tourists annually from all over the world. They come for the sunny climate, amazing surfing beaches, major theme parks, world-class shopping, luxurious spas, championship golf courses, award-winning restaurants, and lively nightlife. If that’s not enough, festivals and events happen almost every month of the year, showcasing sporting and cultural events of every description. With over 37 miles of beach and four impressive point breaks, Gold Coast offers some of the best, most consistent waves in Australia. No wonder it is home to a suburb called Surfers Paradise. If you’ve never surfed before, you can get expert instruction here or in neighboring Burleigh Heads. After riding the waves, take a short ride westward and explore the World-Heritage-listed national parks of the Gold Coast hinterland. Especially notable for its natural beauty is Lamington National Park, 28 miles to the southwest. Awesome mountain views, waterfalls, crystal-clear pools, caves, rainforests, varied wildlife, towering forests -- they all make for a tranquil commune with nature and some of the best bushwalking in Queensland. For the culture-centric, the Arts Centre Gold Coast is the premier venue for visual and performing arts. It features an art gallery exhibiting local and international works including painting, sculpture and new media. 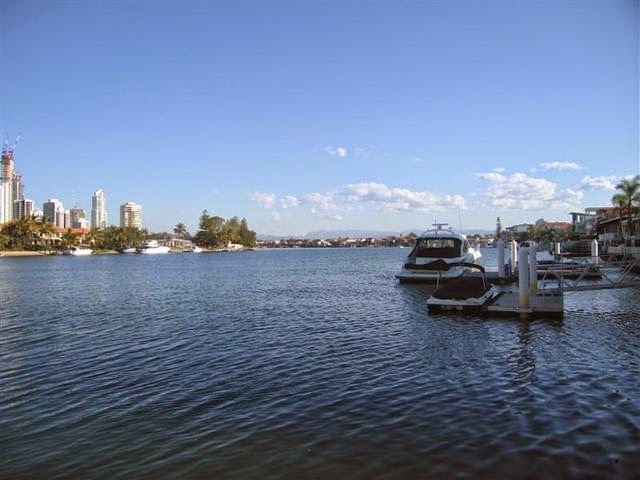 Waterfront living is a sought-after feature of Gold Coast real estate. There are over 550 miles (890 km) of constructed residential waterfront land within the city. Most canals are extensions to the Nerang River. 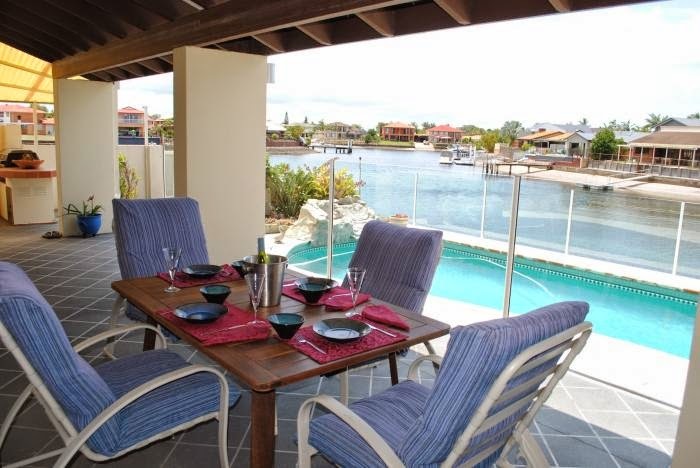 All of your International Vacation Home Exchange property choices on Gold Coast are either on or near the ocean or picturesque canals and waterways. 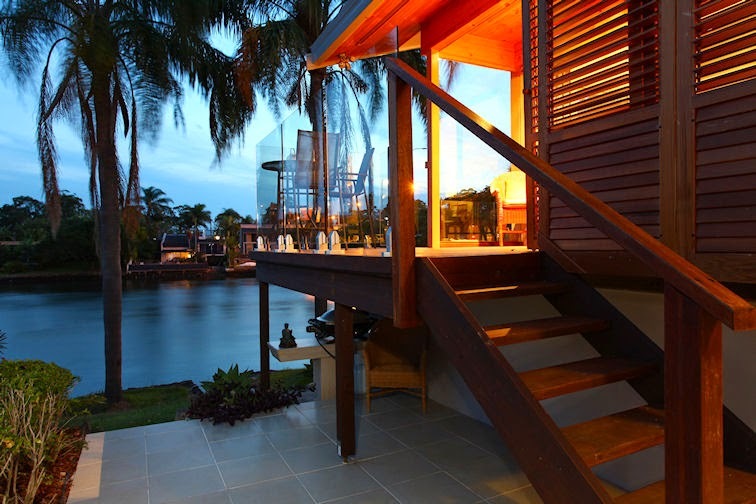 This Boathouse is on the northern foreshore of the Nerang River, right in the centre of the Gold Coast. Public transportation is one minute away, giving you easy access to the theme parks, surf beaches, shopping and dining. 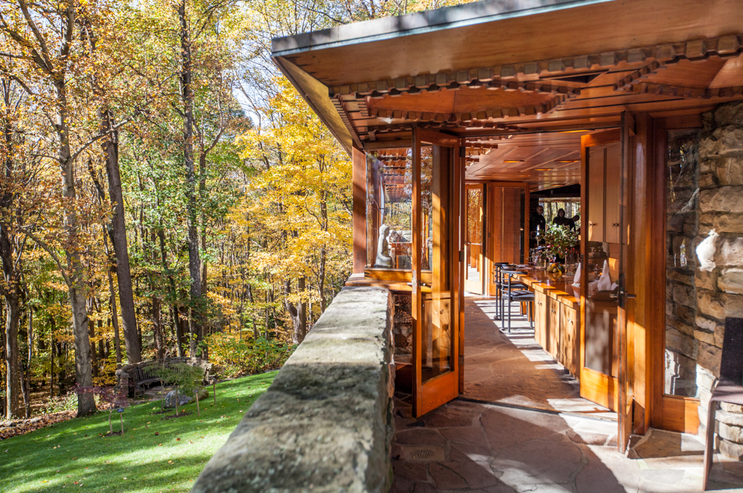 The home is completely renovated and features a new kitchen, three porcelain-tiled bathrooms (two en suite) an outdoor hot tub, and an elevated deck overlooking the Main River. Located on the river waterfront with a view of the mountains in the hinterland, this apartment is just out of the center of Surfer’s Paradise and less than a five minute walk to the beach. A deep balcony runs the length of the apartment and is open to every room. There is a shared swimming pool, a BBQ area and mooring space for four boats. The kitchen is fully equipped, and the master bedroom has an en-suite bathroom. Runaway Bay is a northern Gold Coast suburb with a reputation for great fishing. Your home here is on a colorful canal with fishing right outside your door. The master bedroom upstairs has an en-suite bathroom and a balcony overlooking the pool and canal. There is a second bedroom upstairs, and two downstairs. 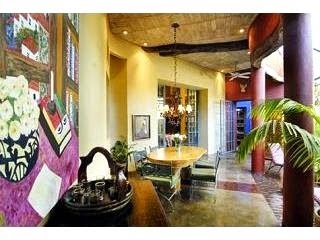 The main living area, dining room and fully equipped kitchen are downstairs facing the canal and pool. Another Runaway Bay jewel, this cozy apartment is in easy walking distance to the water, a shopping centre, and a boardwalk and bike path leading to Surfer’s Paradise. Convenient bus service is right outside the door, or you can use the host’s car for just two extra credits. 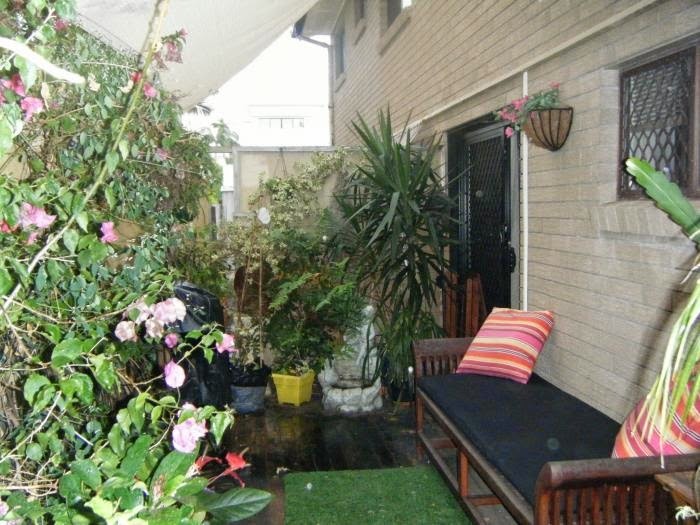 The apartment has all modern conveniences, plus a lovely courtyard with barbecue grill. 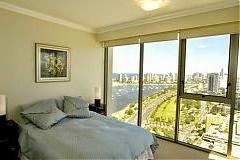 This quiet, elegant apartment in the sky is in Pivotal Point, a new residential resort complex overlooking the Gold Coast Harbour and the Pacific Ocean. It offers incredible views from large picture windows and three spacious balconies where you can entertain or just relax and watch the pulse of the city and the harbour below. The apartment features luxury furniture, high ceilings, a fully-equipped gourmet kitchen with granite countertops, home-entertainment equipment galore, and secure carpark and elevator access. There is a gymnasium on the ground floor along with a heated pool, playground area, spa, sauna and entertainment deck. For additional photos and information on any of these exciting accommodations in Gold Coast, click the home exchange properties above.